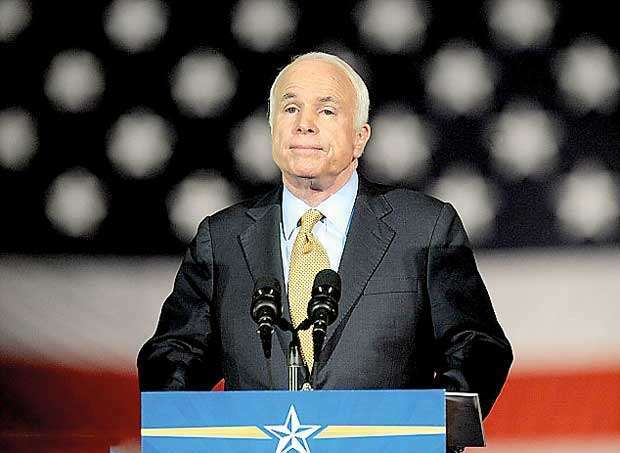 ‘Maverick’ Senator John McCain has died aged 81 following a battle with cancer. McCain died following a year long fight against brain cancer on Saturday, surrounded by his wife Cindy and their family. Shortly after 7pm local time a hearse left the estate and led a motorcade as McCain’s body was removed from the family home to be transported to Phoenix, with a number of people seen lining the route. No date has been set for his funeral but he will be laid to rest at the U.S. Naval Academy Cemetery in Annapolis, Maryland. The news came just a day after his family announced he was to stop receiving treatment for cancer. He would have celebrated his 82nd birthday on Wednesday. And on Saturday night the U.S flag could be seen flying at half mast above the White House. He was said to have spent his final days at ‘the cabin’ with his family, and before he ended his treatment spent his days looking out at the surrounding grass and sycamore trees. McCain had been locked in a war of words with Donald Trump dating back to 2015 and he has specified he does not wish the president to attend his funeral. Following the announcement that McCain’s cancer treatment was to be discontinued tributes from across the world flooded in but Trump remained silent. However, as the news of McCain’s death broke on Saturday Trump took to Twitter. But despite offering his condolences to the senator’s family he did not pay tribute to the veteran.